Hill Tracks in the Cairngorms, within or without the Cairngorms National Park, has continued to involve a good deal of NEMTs time and there is a fair bit to report in this issue of Mountain Views. Readers will recall that Invercauld Estate submitted a Retrospective Planning Application for these tracks just a few days before the Cairngorms National Park was officially launched, thus leaving any legal consideration firmly within the jurisdiction of Aberdeenshire Council. This was in August 2003 to be exact. NEMT wrote to the Council and requested permission to make a presentation to the Marr Area Committee when this application came up for their consideration. On the duly appointed date, 13th December, 05, (3 years and 3 months later) Kenny Freeman addressed the Committee on behalf on NEMT and Kenny Ferguson made a separate address on an independent basis. Prior to the meeting this application was recommended for approval subject to a number of conditions. If they had not taken unpaid time out to bring their 30 years of knowledge of this glen to the Committees attention, and stimulated deeper discussion on the implications of continuing to allow this sort of back-door development in the Park, then the status quo may well have remained the same. Thus when a motion to reject the planners recommendation was raised, Councillors Jenny Watson and Bruce Luffman spoke in favour of rejection. The Committee then unanimously rejected this Retrospective Planning Application thus making an important step towards stemming the drive of unchallenged development of hilltracks by the estates within the Park. A key point here was the consideration of when does a well-worked path become a track and as such, fall into the planning regime. It was very interesting to learn, from this meeting, that at present Aberdeenshire Council relies on records that Dr Adam Watson has made over the years of the hill tracks in the Councils area to determine if a hill track is new or already established. It was also extremely encouraging to see it suggested by the Council, at the meeting that a Monitoring Group for these Hill Tracks should be reformed. NEMT has written to Aberdeenshire Council asking what progress has been made towards forming this group and we have confirmed our interest in being involved. Having written the letter to the Council myself, I have to admit I stated this would be an ideal opportunity to allow Adam's valued knowledge of the Cairngorms to be utillised for the benefit of our Members and the Council. It would also, of course, provide a means of pooling the knowledge of the 15,000 Hill Walkers and Climbers that we represent via our NEMT Individual and Group Memberships to very good effect. In the same letter I asked what steps had been taken by the Council to instruct the Invercauld estate to re-instate the tracks in Gleann an t-Slugain as, presumably, the estate would be required to do so, given the rejection of their retrospective application. No response from the Council has been received - as yet. Yes, this track, also on the Invercauld Estate, was featured on the front cover of our last issue of Mountain Views (actually the photo on the front cover of the current issue was, rather ominously, also taken on this track). On this occasion, no planning application was made and once it came to Aberdeenshire Council's attention they issued an enforcement notice to reinstate the track. The Cairngorms National Park Authority supported this action - this was the track that Eric Baird, Deputy Convenor of the Cairngorms National Park Authority referred to in our last issue of Mountain Views. I think many would agree that what has since happened is quite extra-ordinary. 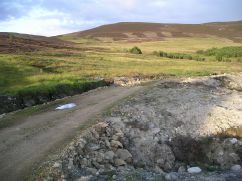 When the individual who had instigated the building of this track, not in this case Invercauld Estate itself - but rather a client of the estate, appealed against the Council's decision, a RW Maslin, Scottish Executive Reporter visited the site and subsequently overthrew the Council's decision. Yes, never mind our own Council AND the CNPA, this individual has the power to overthrow the decision of both. Now keep reading .... Dr Adam Watson together with two soil scientists, Sandy Walker and Rodney Heslop, who have great professional skills and experience in these fields, visited the Balmore to Auchtavan Track last November, with a copy of R W Maslin's report. They were seriously concerned by the very evident lack of knowledge, experience or competence of this individual as made apparent by the content of his report. I therefore wrote to Mr James McKinnon, Scottish Executive Chief Planner to point out our concerns. I have received a reply that advises: "I believe that the enforcement notice appeal decision to which you refer is the subject of an appeal in the Court of Session. l am sure you will understand why l am unable to comment on the case in those circumstances." We are also referred to another consultation on these issues that NEMT may wish to participate in. If you can stay with this thread just but a bit further, this through the weary and often incomprehensible corridors of Scotland's planning bureaucracy, just let me finish by saying that the Reporter made a condition on "his" allowing the Balmore to Auchtavan hilltrack to remain as it was. He stated that "Within 2 months of the date of his letter (22nd December 2005) a scheme of seed planting for those parts of the enforcement site affected by the development hereby approved shall be submitted to the planning authority for its consideration and approval." and he goes on to list 6 details of this scheme. Now in my aforementioned letter to the Council, I enquired if these conditions had infact been met. I have my doubts and now ask: "Is this really the way to look after our newly designated Cairngorms National Park?" Over recent months a group of NEMT members have been putting their heads together to try and find a way out of the endless roller coaster that clearly demonstrates a no-win situation for any parties when it comes to the handling of hill tracks in the Cairngorms. The group has now completed a Proposal entitled "BETTER PROTECTION FOR WILD LAND Proposal to Establish a Project Team". This proposal focuses specifically on researching all of the pressures and issues connected with hill tracks in the Cairngorms. We see a better understanding of these issues as the route to mitigating and ultimately removing the unresolved conflict between the issues and to ultimately achieve "Better Protection of Wild Land". Rather than building up an us-and-you situation, between landowner and land-user, we believe the solution is in carrying out the research first and then stimulate discussion and debate to find an effective formula that will work to better effect for all, future generations included. We are encouraged by the fact our submission of this Proposal to SNH won a very positive letter back from Ron Macdonald, Area Manager, Grampian. He stated "SNH is very much taken with the NEMT Proposal which has the potential to inform public development and protection within the Cairngorms National Park and as an opportunity for public and voluntary sectors to work up priorities, mechanisms and actions to protect and enhance wild land." At the time of going to press we are hoping to progress discussions with SNH. Whilst we pledge to keep like minded NGOs closely informed and integrated into the research that we hope to progress, we advise we may well be looking for input from our NEMT members to map out what is happening at the present time with regards to hilltracks in the Cairngorms.